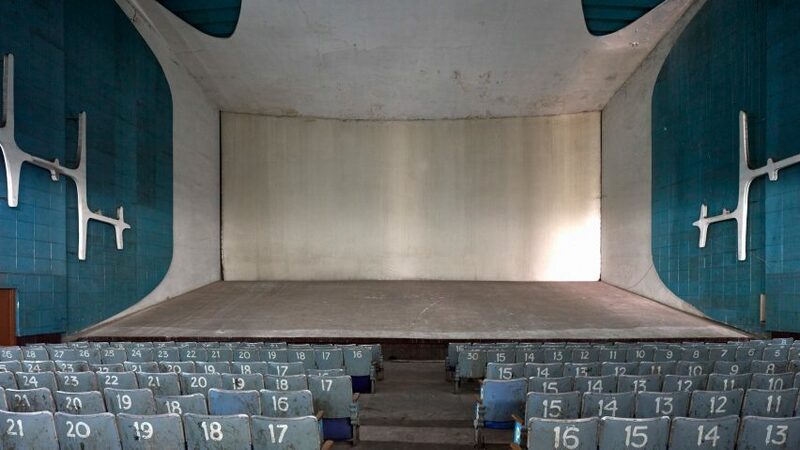 Built in the early 1950s, Neelam Theatre is located in Sector 17, the commercial district of the modernist city that was famously masterplanned by Le Corbusier in post-independence India. But the building was actually designed by Aditya Prakash, one of six Indian architects assigned to work with Le Corbusier and his cousin, French architect Pierre Jeanerret, during the construction of Chandigarh. Despite his central role in the masterplan, Le Corbusier's involvement in the commercial district was quite limited. "I'm sure he came to Sector 17, but he had nothing to do with it – and I don't think he cared either," explained Prakash’s son Vikram, who is an architectural historian at the University of Washington. Aditya Prakash was initially appointed to work on Chandigarh's government museum complex in 1952. When the time came for the three cinemas to be designed in Sector 17, he was a natural choice. "He was an absolutely committed, thoroughbred modernist," said Vikram Prakash. "Everything he learned about architecture was from Le Corbusier." Throughout the duration of his masterplan, Le Corbusier's focus was the Capitol Complex, comprising the Legislative Assembly, Secretariat and High Court. The trio of government buildings were made from concrete moulded into gridded and scalloped formations, decorated with brightly coloured paintwork. However it was the commercial district – which included two other theatres built by Prakash: Jagat Theatre and Tagore Theatre – that grew to be the cultural and social hub of Chandigarh. "Sector 17 is truly the heart of the city," said Vikram Prakash. "It's not the Capital Complex designed by Le Corbusier – which is more famous – but the commercial heart is where the people gather." "In that sense, Neelam cinema and the plaza in front of it is the icon of the city," said Vikram Prakash. "In the popular imagination it stands for the heart of the city." Edmund Sumner's new photographs depict the basic brick shell of the theatre, "a rigorous modernist box" with a bulging curve that erupts above the entrance. The concrete contour is generated by a continuation of the intended acoustic curve of the interior of the theatre. Two huge, windowless walls bookend the open-fronted facade, which sits at the west end of the main public square of the city. "The rigorous acoustic curve from the outside was intended to continued all the way through the middle and go all around," said Vikram Prakash. "Aditya was extremely interested in acoustics, that was his passion." Sumner's photographs also show the well-worn interior of the 960-seat cinema. Layers of blue tile-panelling form ridges across the walls and sweeping auditorium ceiling. Huge decorative steel cut patterns shaped like sound waves line the walls of the theatre. Upstairs on the balcony level, a billowing perforated canopy covers the ceiling. Prakash's use of decorative details here echo typical modernist geometric patterns, with his embellishments influenced by his own art. "His second determinate was, given a set of rules, how can you create freeform? That was in sense his true love, because he painted every day," Vikram Prakash said. "If you look at his artwork, it’s sort of a search for free flowing lines with an underlying form," he added. "While the building's external shell is rigorously functional, the interior is a modernist freeflow play." Prakash's most famous structure, KC Theatre – built in the 1970s – was demolished in 2005, three years before the architect's death. It prompted a huge outcry in the city. Neelam Theatre is still a functioning cinema, but commercial developers pose an imminent threat to the modernist building. Without protection, it could easily suffer the same fate – but the architect's son says it is hard to get a listing. "The majority of these massive theatres don’t make money anymore, so most of them have been converted into multiplexes," he said. "I am quite sure that the owners of Neelam Theatre are devising a strategy to transform it. Because it's not protected, it's not on the UNESCO dossier – it's not Le Corbusier!" By contrast, the Capital Complex is one of 17 Le Corbusier projects listed on UNESCO's World Heritage list, where it is praised as a radical experiment in modernist planning and architecture. Other works recognised on the list include Maison La Roche-Jeanneret in Paris and Chapelle Notre Dame du Haut in Ronchamp, France.